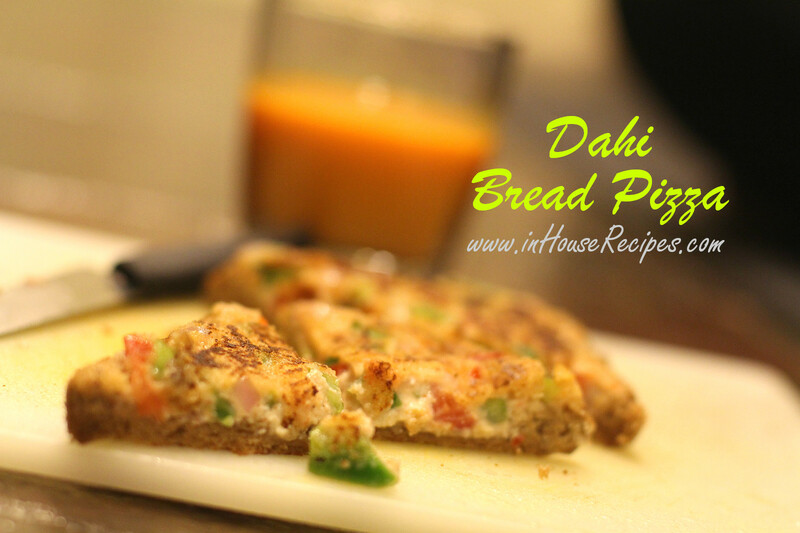 Yield 4 piece - 4x4"
Bread Pizza with Dahi or Curd is a desi adaptation of the more famous Italian Pizza. We have shared the Bread Pizza recipe earlier as well with the primary ingredient as Malai (Milk Cream). The current one is another variation of the same recipe with replacement of Cream with Curd. If you have already tried this recipe earlier with Malai and never knew that Curd (Dahi) can also be used, then here is the tried and tested version specially for you. This is a pretty tasty, easy, healthy and quick snack time recipe and most of the north Indians would have tasted it from their Dadi's hand. The only issue that we came to know when people asked us was the substitute of Malai in the dish and hence this recipe for you. This one is also a favorite with kids. I know because i am a mother of a really fussy kid and he enjoys this bread pizza. NOTE: If you don’t like any of the ingredients the vegetables then you can replace it with your favorite vegetable like sweet Corns or anything else. You can use any color Bell Pepper or all 3 colors yellow, Green,Red in Pizza too. NOTE: If the curd is not thick, then the vegetables will not stick to the bread base. If you do not have thick Curd, then keep your light Curd in a sieve for about 4-5 minutes to drain extra water before starting with this recipe. Add all the vegetables like Tomatoes, Bell Peppers, Onions along with half of the quantity of Semolina in bowl. Add Red Chili powder, Garam masala powder and Green Chili. Add Curd and rest of the Semolina as well. Add the Salt. Mix well. Pizza mixture is ready to use. Switch ON the stove on high flame and let the pan get heated. Take 1 bread slice and spread the mixture on its one side with a help of a spoon. Make sure the slice has curd mixture all over it. Do not forget to spread it on the corners as well. Repeat the same with the other 2 slices. Turn the stove on medium flame and add 1 tbsp of Oil in pan. Place the Pizza bread with the Curd topping facing up, in the pan. Twist and shake the pan a bit to make sure that the Oil reaches all the corners of bread. Let it cook for about 2 minutes or till the time the base gets golden brown and crispy. You can even check the color of base by lifting it using a spatula. Add 1/2 tsp of oil on its face once it gets crispy and golden brown from bottom. Flip the bread. Flipping would be easy if you pick the whole bread on a spatula and turn it over in one shot. Drop a tsp of Oil cycling clockwise on all the corners of bread. After a minute, use the spatula to separate the bread from the pan. Let it cook for about 1 more minute. Take it out from pan and serve hot once it gets golden brown from both sides. 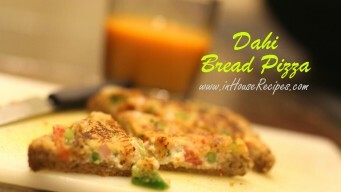 Desi Bread Pizza with Dahi is ready to enjoy. Enjoy it in morning breakfast with a sip of hot Chai or Coffee. This desi style bread pizza would taste best fresh. You can refrigerate it to carry over to next day but the taste might suffer. One point to note here is that the topping contains Curd Dahi paste. So, if you do not consume it immediately after cooking, the dahi might drain its water within an hour or so and make the bread wet. This may or may not leave the bread Pizza in eatable state. We normally eat it in breakfast, sometime morning and other times in evening with sips of hot coffee/tea.